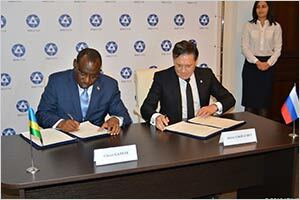 Rwanda minister of infrastructure Claver Gatete, and ROSATOM's director general, Aleksey Likhachev, signed a co-operation agreement aimed at the construction of a Center for Nuclear Science and Technology (CNST) and of a Nuclear Power Plant in Rwanda in the field of peaceful uses of atomic energy. The cooperation agreement will set a foundation for active conversation between the two Nations in the field of peaceful implementation of atomic energy and will agree to practical implementation of particular projects. Likhachev said: “We are happy to share our more than 70 years’ expertise in the field of peaceful use of nuclear technologies with our Rwandan partners. We hope that our cooperation in that area will contribute to the economic growth and improve the quality of life of the Rwandan population”. The agreement includes legal basis for interaction between Rwanda and Russia which states the elaboration of the regulation in the field of nuclear safety, supervision of physical protection of nuclear materials radiation sources, storage facilities of nuclear and radioactive materials, it further continues with Supervision of the accounting and control of nuclear and radiation materials and radioactive waste, Fundamental and applied research in the field of peaceful atom, Manufacturing of radioisotopes and their application in manufacturing, agriculture and healthcare and training and development of specialists for the nuclear industry. The research is done in order find solutions towards development of the nuclear power station in Rwanda. Which will be also used in generating electricity, in agriculture as well as in mining. Amb. Gatete said that Rwanda is making positive steps in promoting health, agriculture and mining without forgetting environment protection. He also said that Rwanda will continue to send more students who will be given the opportunity to train in ROSATOM.